Howard Levy, whose basketball resume includes championship success as a player and coach on both the Division I and international levels, has been named the head men's basketball coach at Mercer, according to MCCC Director of Athletics John Simone. 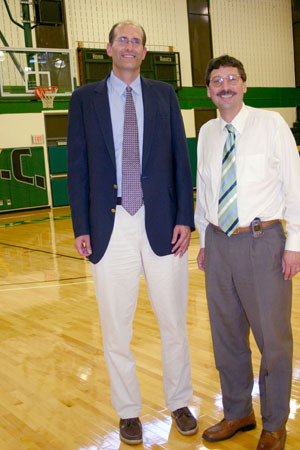 Levy served as assistant coach for men's basketball at Princeton University from1996-2007 and is an alumnus of Princeton, where he was a center for the Tigers for four seasons. According to Simone, the selection of Levy is a real asset for the Mercer program. "Howard has an in-depth understanding of the game and the elements that contribute to team success. He comes to Mercer with a wealth of experience that includes his many years as a player and a coach. Through his work with student-athletes, he truly understands the importance of excelling both on the court and in the classroom. We are fortunate that he will join our coaching staff." Levy takes over from Kelly Williams, who spent nine years as the Vikings' head coach and was recently named head coach for men's basketball at The College of New Jersey. Levy said, "I am excited for the opportunity to bring all that I have learned over the years to Mercer and to continue the great work that Kelly has done here. We are going to work our hardest to reach our potential as a team and in the classroom. If we do that, I know that plenty of victories will come." During his basketball career at Princeton, the six-foot-ten Levy contributed to Ivy League championships in 1983 and 1984, and achieved a school record for career field goal percentage (.647). He earned a gold medal as a member of the U.S. team that traveled to Israel for the 1985 Maccabiah Games. After a tryout with the New Jersey Nets, he played for the Continental Basketball Association's Albany Patroons, where he was coached by the legendary Phil Jackson. He turned next to coaching, spending a season at Trenton State College and then three years as an assistant coach at The George Washington University while pursuing his law degree. During his time coaching at Princeton, Levy was a part of teams that appeared in four NCAA and three NIT Tournaments. Levy is the president and cofounder of Hypnotic Hats, Inc., a successful New York based apparel and accessories company.